I promised myself that the priority at the moment is INSIDE and I dare not get too worked up about peonies and tiger lilies for now, but one can unpack and repack boxes for just so long until a kind of moving mania sets in. When I say “unpack and repack” it might sound counter-productive, but since we’re jumping right into a remodel of the kitchen and also here-and-there much needed storage additions, it would be foolish to clutter the house with any more than the barest necessities. Yet I need to FIND those necessities and they seem to be interspersed in a very piecemeal and helter-skelter manner with the whole of our belongings. Hence – I unpack and then repack and sometimes do it all over again. After more of the same this morning, we were much in need of garden vibrations. 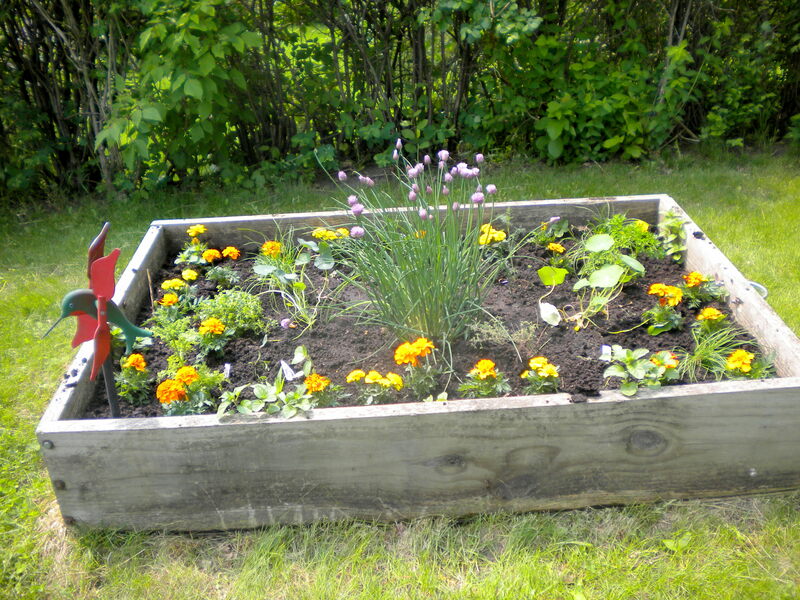 And so we used the one little raised bed which was already here, and since it already had a large garlic chives and of course the greedy sprawling mint which had survived and thrived throughout the long Minnesota winter, turned it into our herb garden. They may be a bit too close for comfort, but we tucked in oregano and thyme, more chives and dill, along with a basil and two rambling nasturtiums all ringed with 4 six-packs of marigolds. It will be anyone’s guess who gets to reap the harvest first, but my odds are on the bunny. 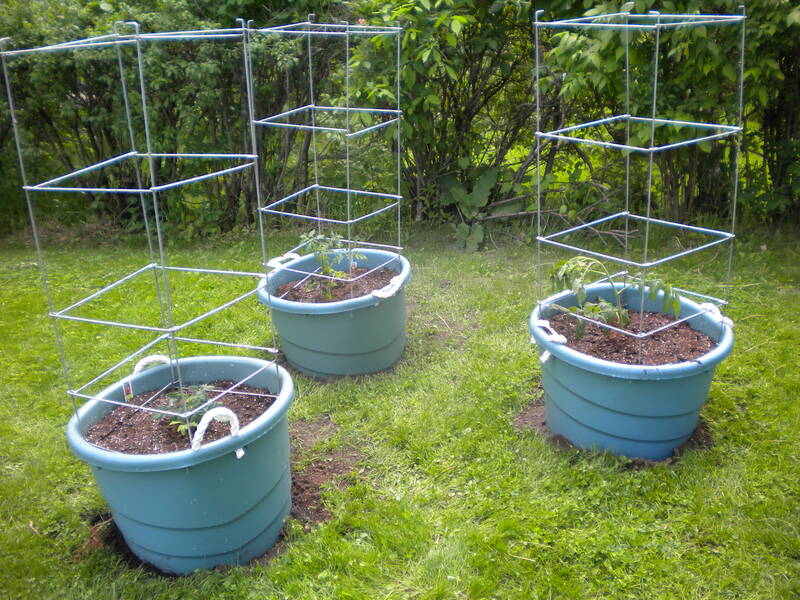 I wanted more tomatoes but settled for three which we put into improvised tubs ($5.49 18 gallon rope-buckets from Home Depot) holes punched in the bottom and set into the ground. There was no contest in selecting Juliet first – our best performer in California, the first and the last – a high yield winner with profuse clusters of grape sized fruit. Hope she likes it here. Robert wanted a Yellow, so as the resident personal chef he gets his way. The reviews for Golden Jubilee were effusive. “Makes great salsa!” – We like that. And “Not as acidic and good for juice”. Aunt Lil cans the best tomato juice. I’ve caught a cousin or two sneaking down to her basement to bring up a couple of quarts for Bloody Mary’s. I’m not sure if I want a Golden Mary, but it just might make a trendy statement. Kind of California Cuisine. And Aunt Lil promised to teach me to make tomato juice. She says it is SO SIMPLE. Red or yellow, I’m game. Our third tomato was a new trial for us also. Big Beef. But I read – “Outstandingly productive!” And “Very best of large varieties! Seems you can’t go wrong with Big Beef. I’m still longing for peonies and tiger lilies. What California girl wouldn’t. 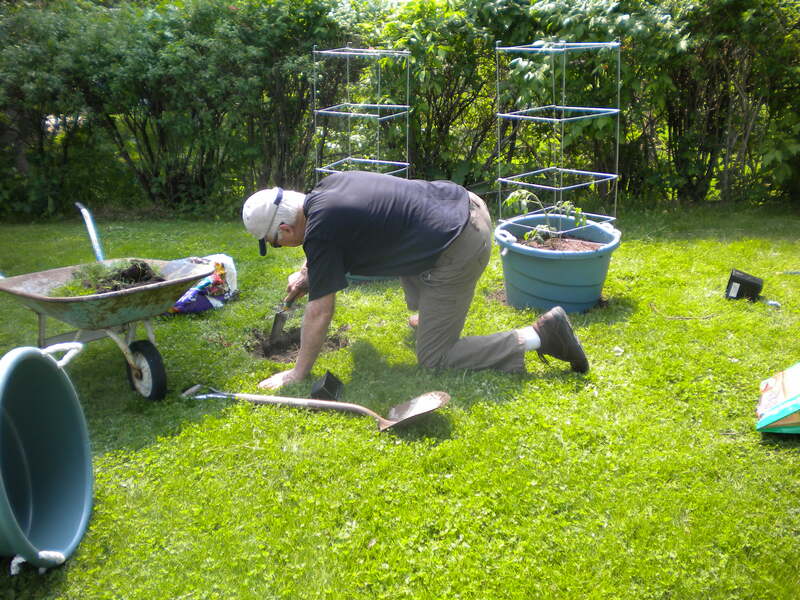 But I had a great day in the garden.